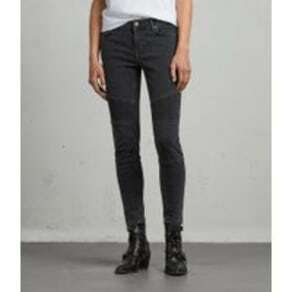 Classic denim jeans, flattering cigarette pants and on-trend dungarees – you can find a selection of jeans, trousers and jumpsuits to suit every style from our London trouser stores such as Topshop, Missguided and Levi's. Every wardrobe needs a pair of jeans, and we have flattering slim-fit, straight-leg and skinny-fit to take you from day to night. Want to create the right impression at the office? Our smart tailored trousers are guaranteed to liven up your work wardrobe. If you’re looking for stylish all-in-ones, discover our fun-loving playsuits, jumpsuits and pinafores. Fitted or loose, floral or classic, full-length or not – it’s up to you to decide. Don’t miss out on this season’s latest jeans, trousers and jumpsuits, and take your pick from a host of different shapes and styles to complement your figure. At Westfield, you can find women’s jeans, trousers and jumpsuits for all kinds of occasion. Shop our retailers current collections today and find your ideal style.